Great location. Kitchen overlooking the river. The property is above a pub (but little noise heard), and on the same road as many places to eat and drink. V short walk to the main bar area. Beds all very comfy. Kitchen has all you’d need. Great location, beautiful part of Norwich. Big, clean apartment. Location, facilities and size of property. Fantastic time. Fully recommend. Friendly helpful host. Lots of room and plenty of space/chairs to sit in for everyone staying. Shower was modern and very clean (waterfall overhead shower plus separate moveable shower head) - perhaps it has recently been updated, as I see complaints in other reviews but it was absolutely fine for us, no problems with temp or pressure. We did have a couple of pressure jumps on the taps while we were there but nothing longer than a few seconds. There is a curtain in the bathroom you can pull across so you can leave the door unlocked while showering, in case someone else is desperate for a wee! Great central location, parking space if needed is secure (in a garage) and very nearby. Great communication during the whole trip with the host. Spacious living room, and three separate bedrooms was perfect for a group of 5. Recommended for a weekend trip to Carrow Road. Great apartment, Clean, warm and comfortable. Great location. Secure parking. Pleasant host. Lock in a great price for Stay Norwich Apartment River View – rated 8.8 by recent guests! 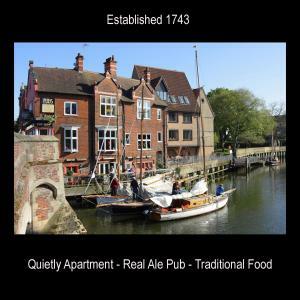 Stay Norwich Apartment River View, a property with a terrace and a bar, is located in Norwich, a 7-minute walk from Norwich Cathedral. Featuring river and garden views, this apartment also provides guests with free WiFi. The apartment consists of 1 bathroom with free toiletries and a hair dryer, and a living room. There's a seating area, a dining area and a kitchen complete with an oven, a microwave and a toaster. Speaking English and French, staff are always on hand to help at the reception. Norwich City Football Club is 1.2 miles from the apartment, while University of East Anglia is 3.2 miles away. Norwich International Airport is 6 miles from the property. When would you like to stay at Stay Norwich Apartment River View? Homely accommodation located at five minute short walk from Norwich train station and canal walks. It is well placed for Norwich business, media and education community within walking distant of the city's tourist attractions, trendy bars and restaurants. This property has 3 bedroom with the addition of a comfortable double sofa bed in the sitting room. This house is ideally suited for corporate and leisure travellers wishing to experience living in the heart of Norwich City centre. I am from France my husband is English and comes from a hospitality background working in some great hotels. House Rules Stay Norwich Apartment River View takes special requests – add in the next step! Stay Norwich Apartment River View accepts these cards and reserves the right to temporarily hold an amount prior to arrival. Please inform Stay Norwich Apartment River View of your expected arrival time in advance. You can use the Special Requests box when booking, or contact the property directly using the contact details in your confirmation. Very noisy above pub and street at night. Didn’t bother us but people should be aware as some folk may not like. It is above a pub and a little noisy but not a major issue. Great location, friendly host, very big. It was very noisy at night. Live music and disco in the pub downstairs kept us awake until midnight. It was so loud that we couldn't hear the TV. Even Sunday night had a late finish with loud music until after 11.30. It's also a very noisy street. Lots of roudy drunks passing at all hours and motorbikes revving up at 4 am. Don't stay here unless you like noise. Noise from the pub below was very loud at night, on Saturday until about 12:30 and on Sunday even louder (live band) but we left before the end so didn't see how long until. This wasn't too bad for us but if you're a light sleeper it would keep you awake, so would be good to be noted in the description. It is a lot quieter in the upstairs rooms (two twins) so light sleepers would be better there. Only 1 shower for 8 people, but this is easily managed. Lack of close parking and only 1 permit for the apartment available for secure parking (which is a 10 min walk away). We were a group of 4 and managed with only one toilet and one shower. However, if there had been more in the group (and this is advertised as an apartment for up to 8 people) the bathroom facilities would have been inadequate. Expensive especially since the apartment is over a very noisy public house.